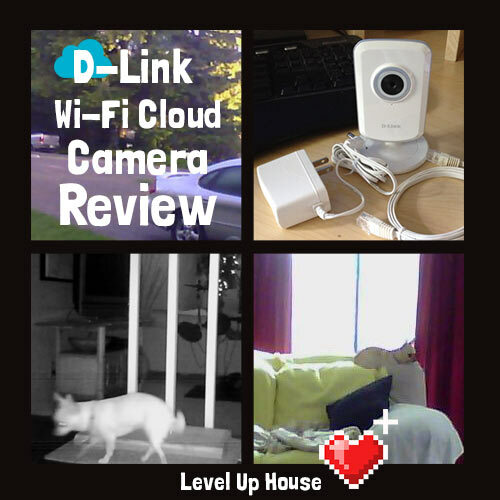 Thing I Like: D-Link Wi-Fi Cloud Camera Review – Spy on your Home! Palm-sized and lightweight, D-Link Cloud cameras let you spy on your home – even in the dark. For a long time, I dismissed home security products as evidence of suburban paranoia run amok. Who wants to dig through archive footage to figure out which neighbor’s dog pooped in your yard? Eh.. not me. But then my dad went down the home surveillance rabbit hole and got me hooked, too. 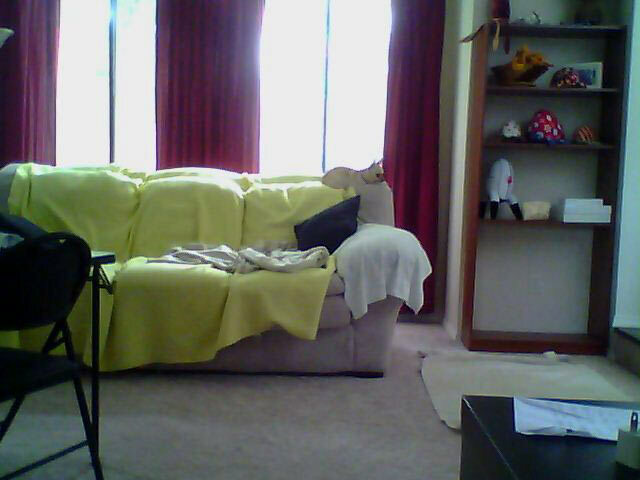 I now have three D-Link Wi-Fi cameras and I think they’re super awesome. I spy on the dog, check that I put the dinner away, and confirm that I closed the garage door. Mundane stuff, sure, but having “eyes” everywhere is awesome. Read on to learn more about these great little cameras and find out which one is best for you. PS: I wasn’t paid or perked to write this review, and I do actually own and use these cameras! The camera shots you’ll see in this review are mine. I’m just a tech enthusiast searching for the best gizmos and gadgets for her home, so if you see an error let me know. The links in this article are Amazon Affiliate links. Purchases made through these links help support this site at no additional cost to you. Read my affiliate disclosure here. Home surveillance via little Wi-Fi cameras isn’t so much about trying to catch a crook, it’s about keeping an eye on things. Who is ringing the doorbell? What are the kids doing in the yard? Is the dog on the couch or chewing up the rug? Did you leave the medicine out? Is the kitchen on fire? At just $45-$100 a pop, it’s easy to get hooked. My Wi-Fi cameras have been in action for 2 months now, and I LOVE checking my “spy network” when I’m away. I spy with my little camera… a yard. 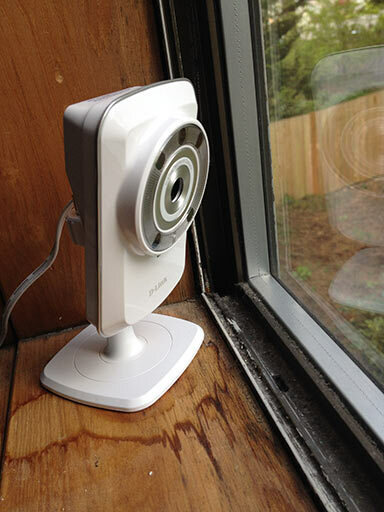 Dropcam is a feature-packed alternative to the D-Link cameras, but be careful not to buy more features than you need. Rapid adoption of broadband and smartphones opened the home monitoring floodgates! There are a ton of brands to choose from, but the major players in the “inexpensive home surveillance” category right now are D-Link, Dropcam, Samsung, and Linksys. Which one you choose basically comes down to your budget and your desired features. 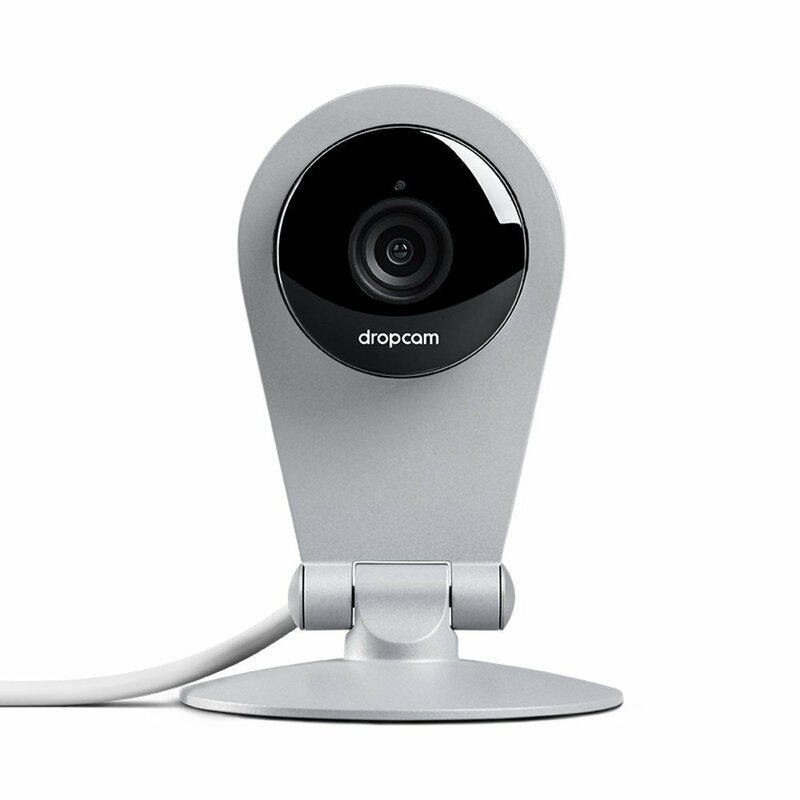 Dropcam, for instance, is another popular home surveillance camera manufacturer, but Dropcams is aimed at a rather sophisticated and upscale ($$$) market. Dropcams are cool, don’t get me wrong – they offer a plethora of great features: remote zoom, tilt, two-way talk, high def video, additional motion-detection sensors, easy wall mounting, and off-site recording as an option. If you don’t need those features, though, there’s no point in paying for them – and you can get 3 or 5 of the most basic D-Link cameras for the cost of one Dropcam(!). I didn’t need Dropcam’s bells and whistles, and I’d rather have 3 good enough cameras instead of one overkill camera, so I went with D-Link. Adjustable camera head: It stays put, too. iOS / Android app: It’s free and it works great. PS: If you’re just getting started with home monitoring, you’ll want to buy all your cameras in the same “family” so you can use 1 app to check them all. Try to choose a brand family that will meet your needs for years to come. Once your camera is set up, it streams live video that you can access via the web portal (http://mydlink.com) and/or via the free iOS/Android app. The video stream looks good and updates every second or so. D-Link makes a big variety of cameras, giving you the flexibility to buy only the features you want. For example, if you just want to check on your dog while you’re out during the day the inexpensive DCS-930L is all you need. If you want to set up a full-fledged home surveillance network, you can buy several remotely controllable cameras and use the built-in D-Link software to watch their feeds simultaneously. ** denotes the models I personally use. Search Amazon for the model(s) you’re interested in to see current prices and stock. All the D-Link cloud camera models are designed to work with your existing Wi-Fi network. You can use a wired Ethernet connection if you prefer, although the provided cable is very short. Some of D-Link’s cameras offer Wi-Fi range extension. This extends the reach of your home’s existing Wi-Fi network and works for all devices (not just more cameras). I love this feature, since my home is rather wide and my Wi-Fi router is in the far end of it. Alas, this also means that if your Internet connection or power goes down, so do your cameras. 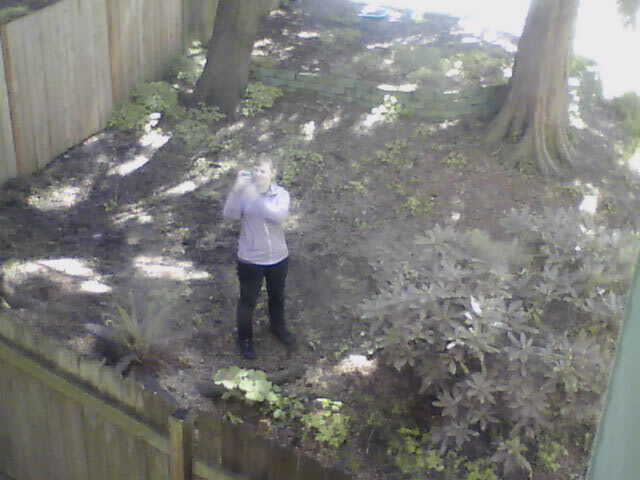 Me in my yard, as seen by a D-Link camera I placed in a second story window. 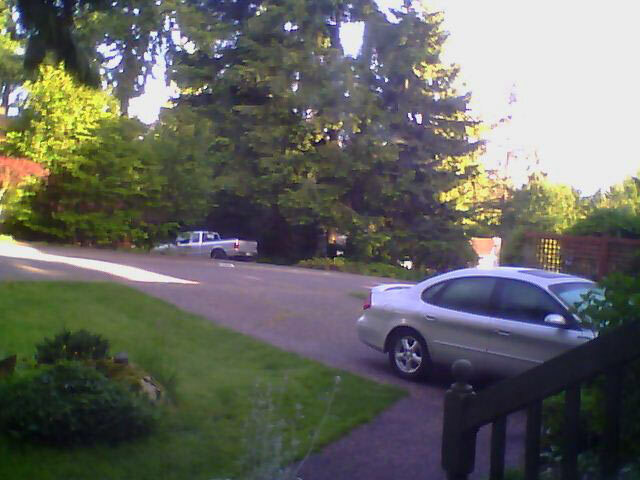 Watching the driveway and front steps with a D-Link camera placed in the front window. 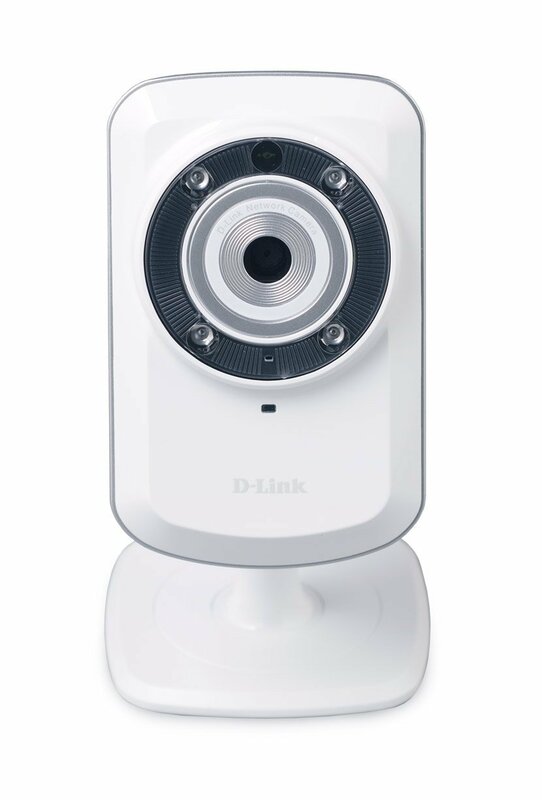 D-Link cloud cameras can see in total darkness up to 15 feet or 26 feet, depending on the model. Cameras that support night vision automatically flip their lens and LEDs as the room’s brightness levels change. The lens changeover is audible, so be careful placing day/night cams into rooms where the clicking sound would annoy you. My dog walks past the family room camera in near-darkness. The only light is coming from the camera’s LEDs and the dim lamp at the far end of the room. The camera makes the room look MUCH brighter than it was in real life. Some DLink cameras support recording to a removable SD card. I haven’t really felt the need to record what my cameras see for later review (I just watch in realtime), but all the DLink Wi-Fi cameras can be configured via DLink’s software to save footage to a hard drive. Or! You can a model that supports on-camera recording, like the DCS-942L model. 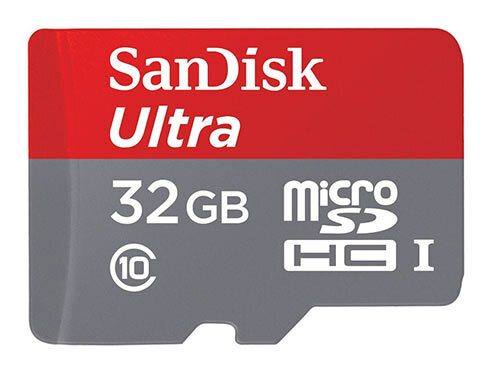 You can stick a 32GB MicroSD card into this bad boy and record an entire weekend worth of (low frame rate) footage. Then I realized the power of pointing the camera into the house. Living room: Keep an eye on your dog/kids/spouse. Basement: Is that storm sending water into the basement? Or did you just leave the lights on? General peace of mind. Confirm that the house did not, in fact, burn down while you are away on vacation. Yay! Yard surveillance: Did you leave the gate open? What are the kids doing out there? A camera pointed into the yard makes it easy to check. Pointed out window towards front door: If your house’s layout allows for it, you can use your cam to see who’s at the door. I can only imagine how much less crap my sister and I would have gotten away with as kids if my mom had access to a network of these little spy cameras. 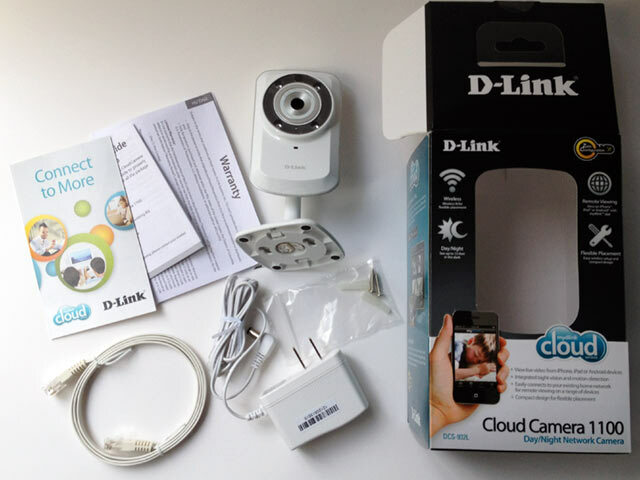 D-Link cloud cameras would also be great for checking on elderly parents, pets, children, contractors, and babysitters. The companion viewing app is called “myDlink Lite” (here’s a link to the iOS version of the app). The app is great. It’s simply laid out, the layout is easy to navigate, and I’ve been impressed by its ability to stream (very choppy) video over even the crappiest 1-bar 3G. 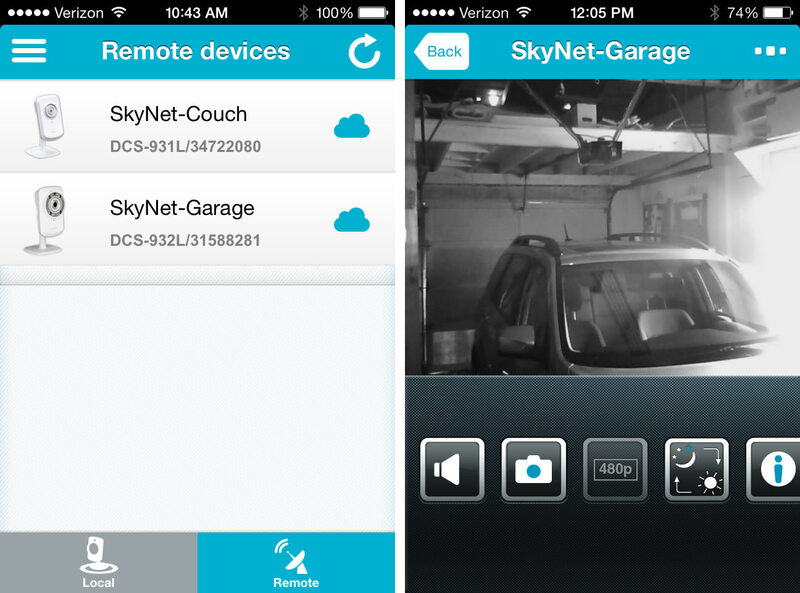 Access any of your cameras remotely via D-Link’s free smartphone app. In the box: D-Link camera, power adapter with a nice long cord, a short white Ethernet cable, and instruction/advertisement booklets. DLink Cloud Camera 1100 (DCS-932L) box contents. 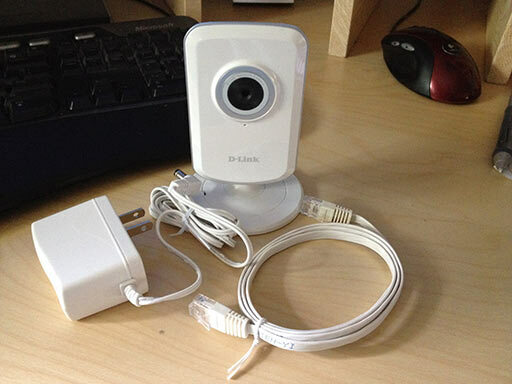 D-Link camera with power cord and included Ethernet cable. 1. Triple check your Wi-Fi password. The installation fails silently if the password is entered wrong. Pretty dumb that it can’t say “hey bonehead, your password is wrong!”, so watch out for that. 2. Access the camera directly via its IP address. Even if you’re having trouble with the installation itself, you might be able to access the camera directly. Go to your router’s control panel (usually accessed via 192.168.0.1) to see a list of connected devices, or start guessing IPs and you might be able to access the camera’s own control panel. My cameras, for example, ended up being something like 192.168.0.7 and 192.168.0.12. 3. Call D-Link’s support line. They’re actually well-trained and English-speaking. They helped my not-so-technical dad through the installation of his cameras. The only complaint I have about the camera installation process is the requirement to upgrade firmware right away. This only seems to affect some cameras – one of mine needed a firmware upgrade as soon as I got it all set up in the right location. Why couldn’t the firmware update have been part of the installation wizard? Updating the firmware requires bringing the camera back to the router and plugging it in directly, so hang onto that Ethernet cable. Other than that, the installation wasn’t a problem and once it’s done it’s good forever (or until there’s a firmware update, which so far has just been once in two months). Night vision works great… unless you’re aiming through a window. The night vision LEDs (the red lights on the front of the camera) create blown-out white spots on the window glass when it’s dark outside. If you don’t need to see through the window at night, just get a daytime camera and point it out the window. If you want night vision through a window, these cameras can’t do it. You’ll need an outdoor camera like the DLink Wireless Day/Night Outdoor (DCS-2332L) which comes in a weatherproof casing . 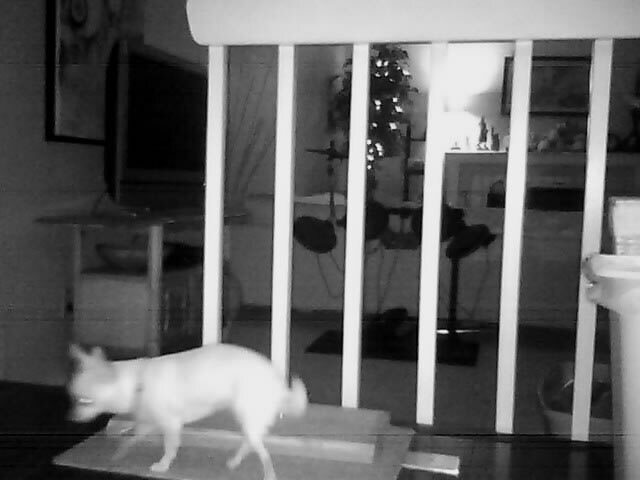 Motion detection is spammy and doesn’t work well. I fiddled with motion detection regions and sensitivities for a month before I finally just gave up and disabled motion detection. The idea is nice: get emailed a picture whenever there’s significant motion. In reality, I was getting spammed tons of photos every time a branch or the sunlight moved. The tech just isn’t there. Cameras can (on occasion) take a long time to reconnect to D-Link’s servers. I don’t know what caused it, but one time I moved my cameras and it took them 30 minutes to become available via the app again. Not battery powered. Your spy network goes down when the power’s out, though I imagine you could hook the camera up to a UPC (and your router, too) for usage during a power outage.